Starring Viola Davis, Michelle Rodriguez, Cynthia Erivo, Brian Tyree Henry and Daniel Kaluuya, the film releases in theaters November 16. At first glance, a heist movie may seem an odd choice for Steve McQueen given his previously helmed flicks, which include the political drama “Hunger” and the award-winning slave flick “12 Years A Slave.” There’s never been reason to think the British director would be interested in a Stateside-based heist flick, but the set-up certainly offers an explanation as the story offers a twist on the typical heist film in that each character that intersects comes from different ethnic, financial and social background. 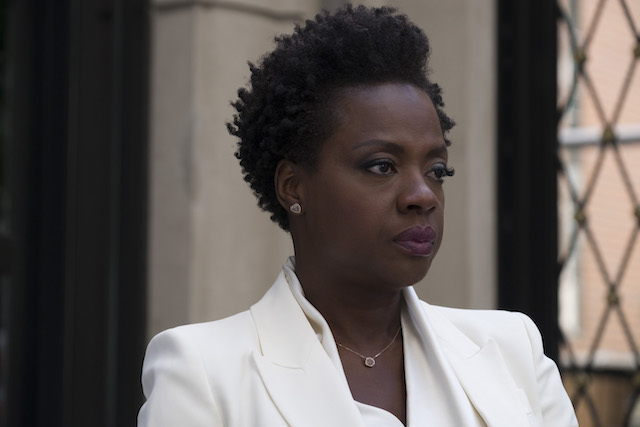 Set in contemporary Chicago amidst a time of political and societal turmoil, Academy-Award winning actress Viola Davis leads the powerhouse cast as Veronica Rawlins, a widow who is forced to pick up the pieces of her life after her husband, Harry (Liam Neeson), is killed in a failed robbery. With mounting debts and an unscrupulous mob seeking to collect, she decides to finish the task he was supposed to commit with the other widows of Harry’s criminal cohorts. It’s a brilliant thriller that tackles love, politics, religion, class, race and criminality. The widows who have nothing to lose include Michelle Rodriguez as Linda, who is struggling to keep her family and dress shop afloat after her husband’s death and Elizabeth Debicki, who plays Alice the Polish immigrant and the least savvy, most sheltered of the widows while Cynthia Erivo rounds off the cast as the street savvy Belle, an ally who steps in to help the women in their quest. A female driven drama with a middle age black female lead, it’s the kind of twisty, cerebral thriller rarely seen onscreen and the brilliance of the film isn’t just in its clever plotting, but in the colorful characters and their interactions. Despite being a caper drama, the film is not marred in movie effects and what McQueen offers is a smart high-concept escapism with a love story between Davis and Neeson at the center of it. Colin Farrell plays a politician who weaves into the widows’ master plan, Brian Tyree Henry plays his political opponent in Chicago’s improvised 18th Ward and a man to whom, Veronica discovers, Harry owes money while Daniel Kaluuya plays his sadistically evil brother Jatemme who is also responsible for muscling in on Veronica to collect the money Harry owes Jamal. 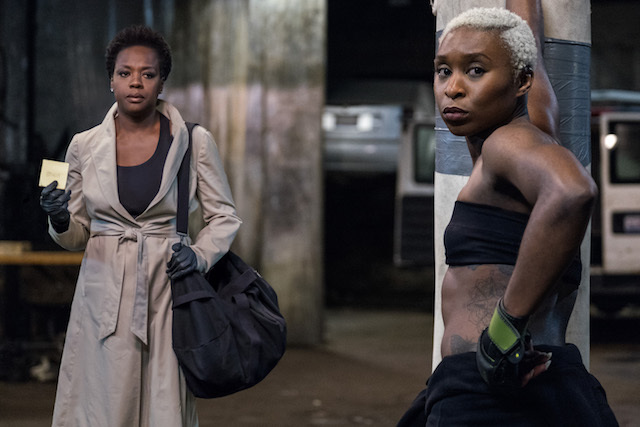 Mournful and angry but ever so exhilarating, “Widows” treats the women’s actions with a mixture of moral weight and satisfying catharsis. We’re convinced their characters have no other recourse but to perform a heist especially after Jatemme threatens Veronica. Strong performances, believable characters and an interesting and well-paced premise keeps you compelled throughout and although it has real tension it finds places to interject a little humor. 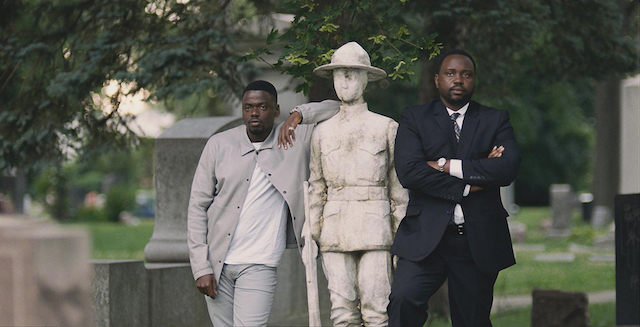 “Widows” is an enjoyable and sophisticated heist movie which is so expertly done that it’s certainly McQueen’s best film to date.